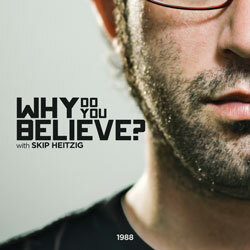 Skip's Teachings > Why Do You Believe? Why do you believe what you believe? In this thought-provoking series, Pastor Skip Heitzig explains how to present an intelligent defense for your belief in Jesus Christ. God has given us scientific and archaeological evidence as well as many fulfilled prophecies in Scriptures that strengthen the validity of our Christian faith. Learn how to effectively and lovingly share the reason for your hope with others.